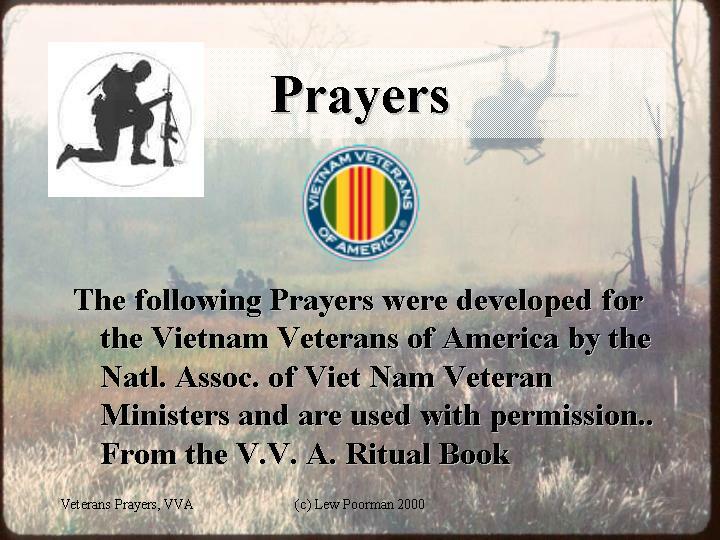 These Prayers were developed by the fine Chaplains that are members of the National Asociation of Vietnam Veteran Ministers and are included in the VVA Ritual Manual. You may save these pictures to your computer and view them there if they appear distorted. They are large @ 100K and are best viewed this way. Please Pray for all of our veterans and servicepersonnel as well as their families and friends. May we see the day when war and bloodshed cease, when a great peace will embrace the whole world. *Then nation will not threaten nation, and mankind will never again know war. For all who live on earth shall realize we have not come into being to hate and destroy. *We have come into being to praise, to labor, to love. Compassionate God, bless the leaders of all nation with the power of compassion. *I will rid the land of vicious beasts and it shall not be ravaged by war. *Let peace fill the earth as the waters fill the sea. Lord, shelter the prisoners of war and those missing in action from the war in Southeast Asia and those of other wars in Korea, Europe and the Far East. Open the hearts and minds of their captors, that they maybe restored to their homes and loved ones. Each has carried the burden of battles. Each has discharged the duties of the obligation of their country. Each has been subjected to hazard, pain, and imprisonment beyond the lot of a soldier. O Lord, these gallant men and women who bear so great a burden must not be forgotten or forsaken. God of Justice, to whom we pray, your compassion we beseech. O God, Creator and Author of all that is living, forgive us for the despoliation of once beautiful land called Viet Nam. May your all-powerful hand restore it to its original garden of Eden beauty. May it never again suffer at the hands of humanity. O Lord, the People! The People! A people we never knew became our enemy. We were so young and so scared -- and so were they! For us, they all looked alike. We shouldn't distinguish the NVA and the VC from an ARVN from a civilian. Our paranoia caused tremendous pain, torture, mutilation, and death. Forgive us, Lord, and heal those who we have afflicted such suffering. We have welcomed refugees to our land. Heal us, so that we may live side by side with them in peace and harmony. May we as concerned citizens of this great land we call America move beyond the past legacy of war to encourage this process of change, to recognize signs of increasing openness and to begin to respond to the genuine humanitarian needs of the Vietnamese people. AMEN. A Prayer for People with PTSD. Higher Power, I know it's not within the harmony of the universe that I be healed from the trauma of remembering without pain. Help me through the pain. Surround me with the golden light of healing, fill me with the white light of peace and love. Help me to bear the pain as I go through the memories. Help me to love myself no matter what happened to me or what I did to survive. Help me to release and let go of my survival skills, the things such as anger and numbness that helped keep me alive, as I become aware of how ineffective they can be in getting me what I want today. To listen to all sighs yet hear a song - I ask Thee Lord! And give a lift to others in strife - I beg Thee Lord! And ever serve with selfless love - I pray Thee Lord! So may it be, dear Lord! Of meeting places high above the common folk. There be no time lost until we greet Thee in the Life Beyond. Grant me the serenity to accept the things I cannot change: the past, what happened to me, that what happened to me was traumatic no matter how effectively I have stuffed it. Courage to change the things I can: my attitude towards my symptoms -- help me to accept them as a normal response to trauma and evidence that I need to take care of myself by talking about what happened to me with a safe person and getting whatever help I need; my actions -- I no longer have to drug, deny or repress my symptoms. I can accept them as evidence of how much I have been through; my reactions -- instead of freaking our or trying to repress what I feel, I can focus on the symptom, whether it is numbness, a painful emotion or memory, dream, or flashback, or a physical reaction, feel what I feel, go through and have the pain and learn whatever it is that my Higher Power wants me to learn and share about the effects of trauma on people. I can change how I see these symptoms -- as normal responses to trauma which helped me to survive and will help me to recover even if they are painful. And the wisdom to know the difference: help me to be willing to accept that I survived something terrible, and that I can learn from it and heal if I look outside my own head for help, and to believe that I deserve to heal whatever I did to survive. guiding you, helping you, healing you. through every darkness, and providing for your every needs. You can be at peace, for you are the Father's child -- innately spiritual, strong, whole. courageous, capable, and able to do all things easily and well. You can be at peace, for you are ever one with the Father, whose loving arms are now around you, bringing release and reassurance. You can be at peace, dear friend, for you are never alone. You have the very spirit of God within you. You can be at peace right now, because God lives within you and is already doing the work that needs to be done within your mind, your emotions, your body, and your life. You can be at peace about everything. I dreamed that I had died. The Lord and I walked side by side, leaving two sets of footprints in the sand. Ahead in the distance, I could see the pearly gate of Heaven I took one last glance behind me, wanting to remember all the footprints I have taken through my life. Behind me, over the smooth and easy paths of my life's journey, there were two sets of footprints in the sand. By where the Lord road was steep and difficult to travel there appeared only one set of footprints. I asked the Lord this question: Lord, I believe that you would walk by my side through my life, during easy times and difficult times, But during the hard journeys, I see only one set of footprints. Why? The Lord answered, "My child, I was with you all through your travels, but along the most difficult paths, I carried you." In the blue-ness of the skies and the warmth of summer, we remember them. In the rustling of the leaves and in the beauty of autumn,we remember them. When we are weary and it needs strength, we remember them. When we are lost and sick of heart, we remember them. we yearn to share, we remember them. or hear "taps" played, we remember them. Grandfather, look at our brokenness. We know that in all creation only the human family has strayed from the Sacred Way. We know that we are the ones who must come back together to walk the Sacred Way. Grandfather, Sacred One, teach us love, compassion, and honor that we may heal the earth and heal each other. and the endurance to accept the consequences of holding to what we believe is right. May we put our trust in the power of good to overcome evil and the power of love to overcome hatred. We pray for the vision to see and the faith to believe in a world emancipated from violence, a new world where fear shall no longer lead men to commit injustice, nor selfishness make them bring suffering to others. Help us to devote our whole life and thought and energy to the task of making peace, praying always for the inspiration and the power to fulfill the destiny for which we and all men were created. O Lord, calm the waves of this heart; and calm it's tempests. Calm thyself, O my soul, so that the divine can act in thee. Calm thyself, O my soul, so that God is able to repose in thee, so that his peace may cover thee. Yes, Father in heaven, often have we found that the world around us cannot give us peace, O but make us feel that thou are able to give us peace; let us know the truth of thy promise; that the whole world may not take away thy peace. He was getting old and paunchy and his hair was falling fast And he sat around the Legion telling stories of the past, Of a war that he had fought in and the deeds that he had done In his exploits with his buddies; they were heroes, every one. And 'tho sometimes to his neighbors, his tales became a joke, All his buddies listened, for they knew where of he spoke. But we'll hear his tales no longer, for old Bob has passed away And the world's a little poorer, for a soldier died today. No he won't be mourned by many, just his children and his wife, For he lived an ordinary very quiet sort of life, He held a job and raised a family, quietly going on his way; And the world won't note his passing; 'tho a soldier died today. When politicians leave this earth, their bodies lie in state, While thousands note their passing and proclaim that they were great, Papers tell of their life stories from the time that they were young, But the passing of a soldier goes unnoticed, and unsung. Is the greatest contribution to the welfare of our land Some jerk who breaks his promise and cons his fellow man? Or the ordinary fellow who in times of war and strife Goes off to serve his Country and offers up his life? The politician's stipend and the style in which he lives Are sometimes disproportionate to the services he gives, While the ordinary soldier, who offered up his all, Is paid off with a medal, and perhaps a pension small. It's so easy to forget them, for it was so long ago That our Bob's and Jim's and Johnny's went to battle, but we know It was not the politicians, with their compromise and ploys, Who won for us the freedom that our country now enjoys. Should you find yourself in danger with your enemies at hand, Would you really want some cop-out with his ever waffling stand? Or would you want a soldier who has sworn to defend His home, his kin, and country, and would fight until the end? He was just a common soldier and his ranks are growing thin But his presence should remind us, we may need his like again. For when countries are in conflict, then we find the soldier's part Is to clean up all the troubles that the politicians start.